Focus on Extreme Metal is a bi-weekly show focusing on all things dark, brutal and extreme. This fast paced show features ton of music, captivating discussion, interviews, latest news headlines, reviews of the latest releases and plenty of segments from contributing metalheads. Join the Extreme Pair of Dario Sycco and Mandy Delamuerte as they dive deep into the dark, complex and technical aspects of death, black, grind and generally extreme forms of metal. Expect the unexpected with offbeat humor and intelligent, hot and explicit nature of this show. Focus on Extreme Metal is not for the faint of heart, only for those who enjoy the darkest, heaviest, fastest and least conventional side of metal. On January 15, 2011, Mandy and Dario have signed a three year deal. This means we are going to be providing you with new podcasts until at least 2014. Focus on Extreme Metal is part of Focus on Metal Network. Network consists of Focus on Extreme Metal and Focus on Classic Metal. Focus on Metal is a feature packed, fast paced internet metal show, featuring music and commentaries focusing only on metal. Your hosts, Dario Sycco, Mandy Delamuerte, Scott Thompson and Julien Dumont have extensive knowledge and previous radio experience as well as a varied metal landscape to cover all styles and all time periods. We focus on metal, everything else is insignificant. 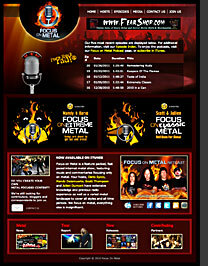 Focus on Metal is a network of two separate shows, Focus on Classic Metal, hosted by Scott Thompson and Julien Dumont and Focus on Extreme Metal, hosted by Dario Sycco and Mandy Delamuerte.